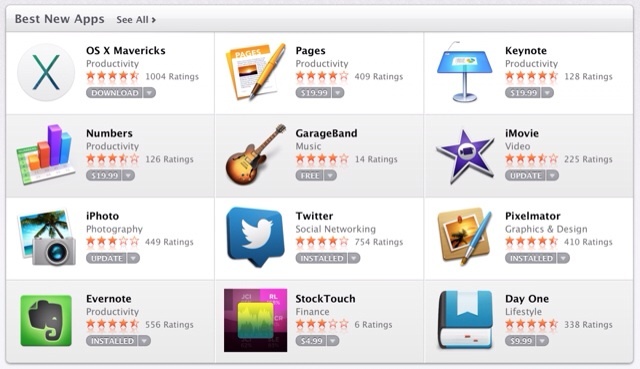 Apple is aware that its Mac App Store is allowing users to pirate copies of the company's iLife, iWork, and other applications, according to a MacTrast report. Earlier today we reported on an apparent bug that resulted in the Mac App Store upgrading illegal and trial versions of Apple apps to the latest official version. Rather than maintain separate updates for these in addition to the Mac App Store versions of each app, Apple has decided to eliminate their legacy software update system for apps entirely. Instead, when Mavericks discovers legacy apps installed on your Mac, it provisions them as a Mac App Store purchase using your Apple ID. It saves us a lot of time, effort, and bandwidth. After the provision is complete, it will appear in your Mac App Store history as though you have purchased the Mac App Store version of the app. In case you're wondering, Apple did announce its iLife and iWork apps were going free; however, that is only with the purchase of a new iOS or OS X device.